People who aren’t into antique shopping don’t understand the urge to pick and browse while you’re on vacation. In Pensacola, in addition to our lifelong beach influence, we’ve had decades of military families moving in and out bringing international treasures and style to our area. We’ve also been an established city for over 400 years, so if anything from, say, the year 1600 forward interests you, chances are somebody just pulled it out of their memaw’s attic. Besides, a true hunter knows that no one store has the same treasures twice, much less an unexplored antique mall a state or two away. 1. Miles Antique Mall, Bayou Blvd. Have a day to spend? Hit Miles! 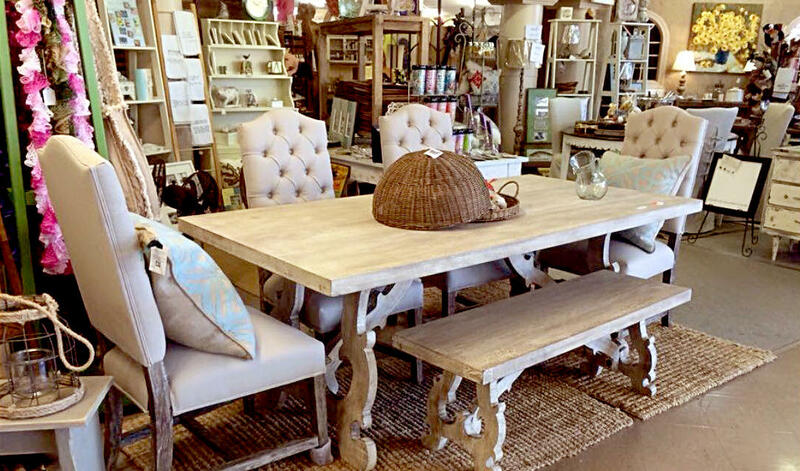 It’s the largest antique mall in Florida with more than 500 vendors on its massive two-floor showroom. Into the Brady Bunch aesthetic? They’ve got it. Recreating a Downton Abbey sitting room? This is a good place to start. Name a decade and they’ve got the goods. Also a great selection of local art, crafts, and rehabbed items. If you wrap things up at Miles, the next logical step is to head south on Ninth Avenue and hit the many local antique favorites along this busy street. First on the list, just a few blocks down the road, is Time and Time Again, known for its mid-mod style. Then it’s a bit of a jaunt south to Poor Richards, which swings the other way with traditional, centuries-old furnishings and architectural fixings. As you continue south toward Downtown, you’ll hit several more traditional standalone shops, including Betty Paul’s Antiques, Jackson Hill Antiques and Interiors, Toad Hall Antiques and Gifts, La Maison D’Elodie and the massive furniture warehouse that is On the Avenue – every last one of them with their own style. 3. Reynalds Collectibles and Antiques, Garden St. Located on Downtown’s main east-west corridor, Reynalds has shelves and shelves and shelves of simply awesome stuff. And there is no way to anticipate what is waiting around the next corner: A cute, kitten cookie jar? A Matisse print? Snarling taxidermy? Upscale rosewood credenza? Bring an open mind and a sense of adventure! 4. Antiques on the Boulevard, Navy Blvd. 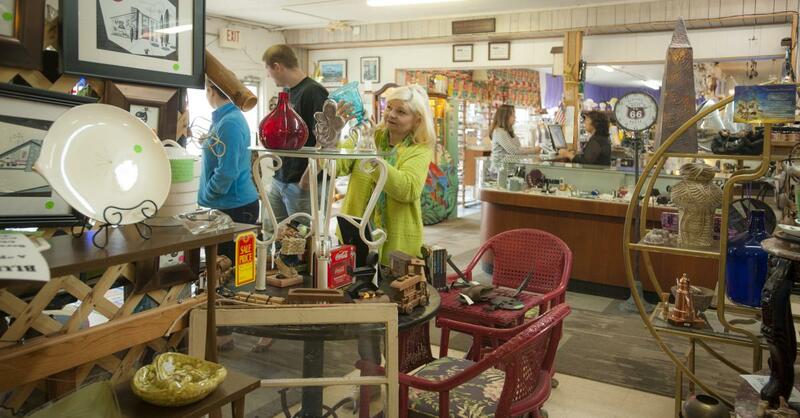 Blue Moon is one of Pensacola’s oldest antique malls and has more than 85 vendors. Carefully curated booths make it a fantastic place to browse and take a trip through home-goods history, but the prices are so reasonable it’s hard to leave without an armload of vintage magic. Blue Moon is also the gateway store to an “antique alley,” with several antique shops west along Navy Blvd., so wear your walking shoes and plan a full afternoon. 5. Franklin Antique Market, Mobile Hwy. This is the one that will take you the furthest off the beaten path, but that&apos;s where you always find that one great thing, isn’t it? Franklin’s humble exterior belies the treasure trove inside. Classics to kitsch, their vendors pack it in, floor to ceiling. Everything from your favorite childhood memories to Rat Pack accouterments is just waiting to be discovered by your keen eagle eye. So, just remember that a souvenir doesn’t have to bear the name of your destination. If it carries a little history and conjures a day of great memories, that’s what it’s all about. Jahna Jacobson has spent nearly every waking hour of the last quarter century writing about Pensacola as both a journalist and a public relations professional. If you need to know where to go, what to eat, what to do, who will be there, she can tell you. She enjoys posting pictures of the Pensacola Beach all winter to annoy and recruit friends and family in her home state of Wisconsin.